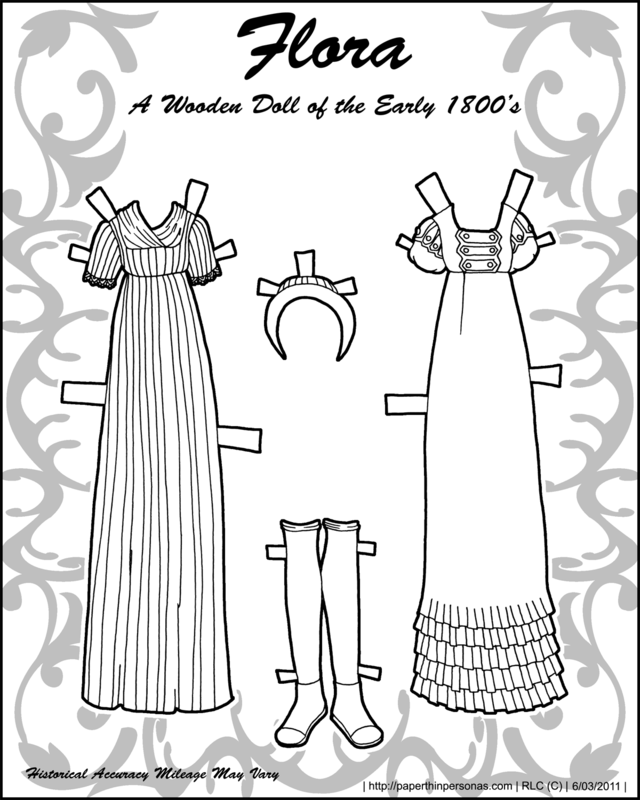 There’s quite a few other Regency paper dolls out there. I thought I would call attention to a few of them along with today’s Flora post. 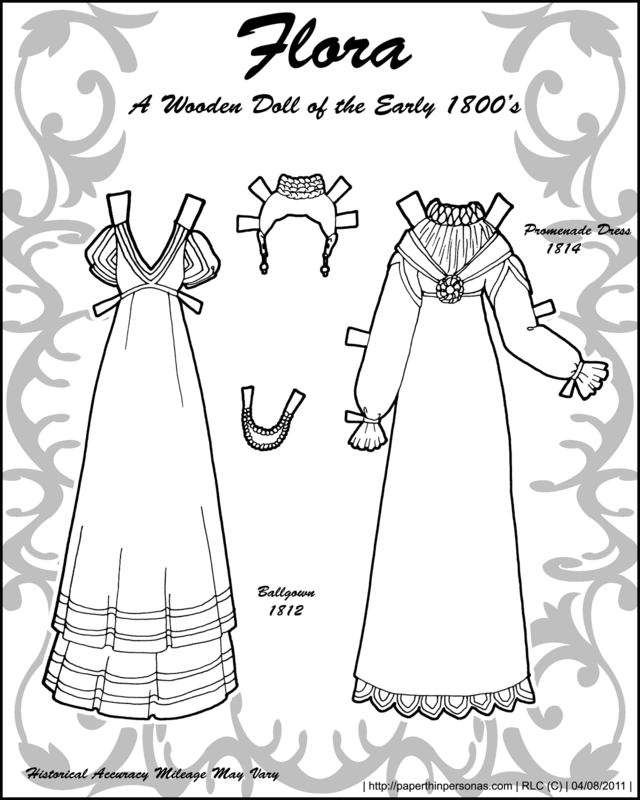 Monica posted a regency dress of her own over at her blog. It’s a beautiful blue and brown one. 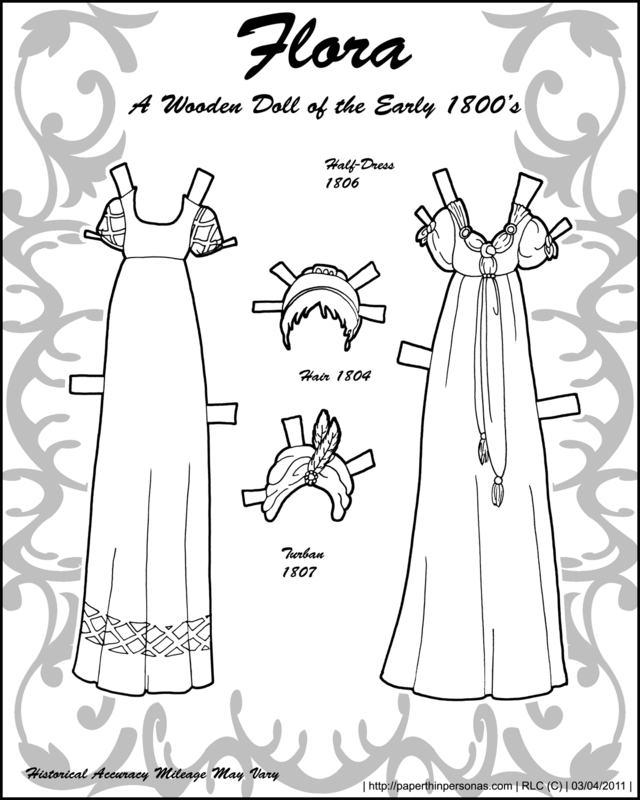 I feel like I should promote other regency paper doll costume since that’s what Flora is all about. 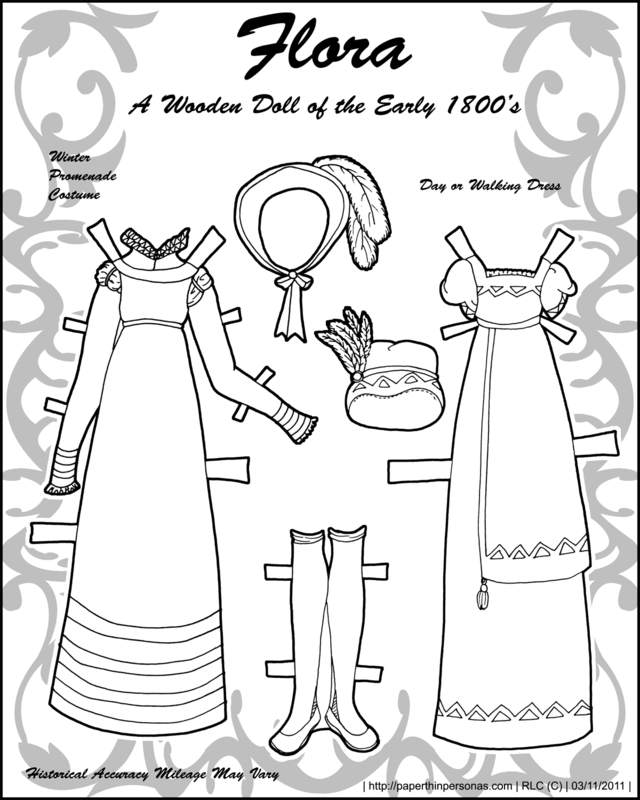 Liana has done some regency paper doll dresses as well with this white one being my favorite. 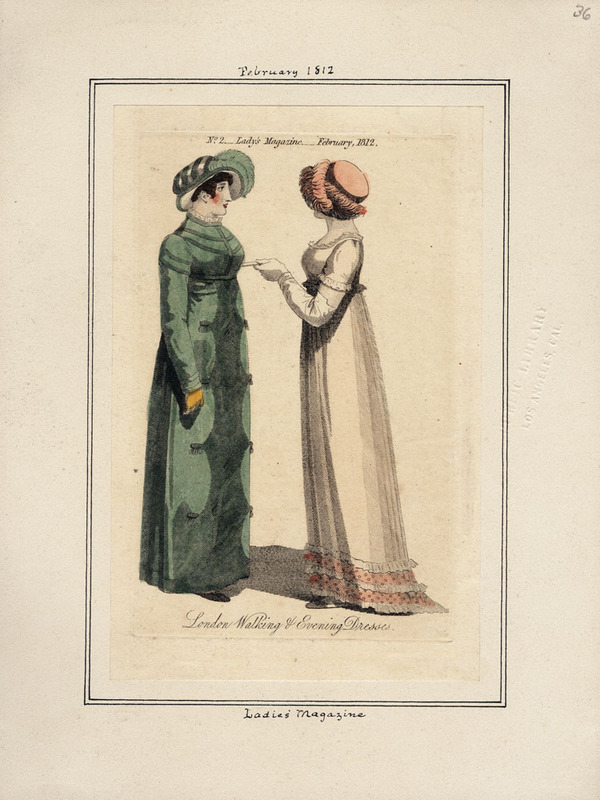 Or, if you want something full color and beautiful, there’s always Helen Page’s Regency Lady of Quality which is lovely, if not terribly historically accurate. 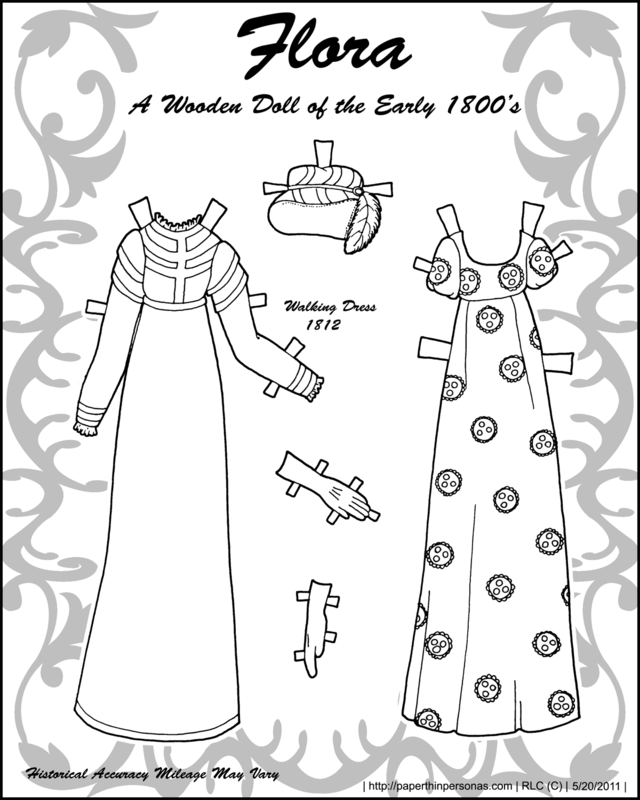 As for the current set of dresses for Flora, we have a walking costume based on a fashion plate from 1812 and a day dress based on the fact that I have a circles template that I don’t use often enough. Also, I wanted to do something with a pattern. Patterns kinda scare me, so I am trying to do them more often, but they are time consuming. 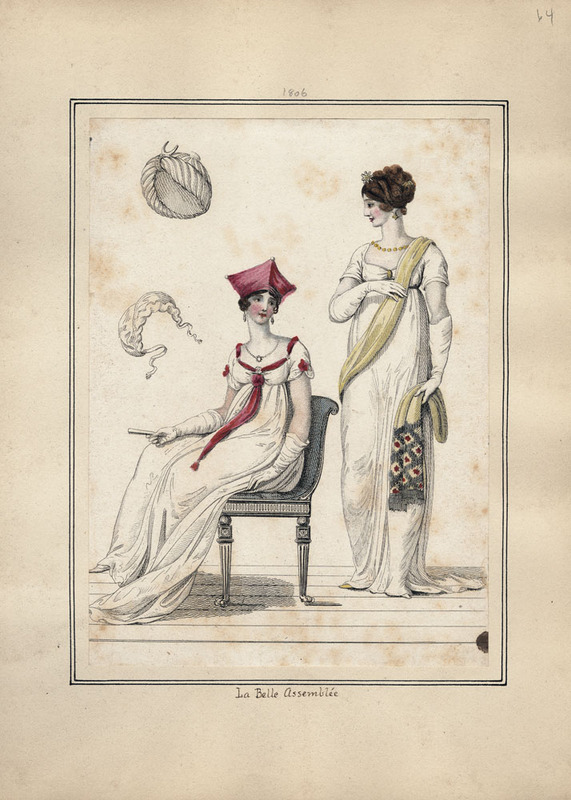 Despite the tendency to assume the entire Regency era was white, there was actually quite a bit of color in fabrics. Turkey red fabrics were especially popular. So, we’re a little late today and I am sorry about that, but as I’ve said a few times around here. School comes first. Flora’s costumes are often challenging, because I like to have lots of reference images before I try to draw anything. 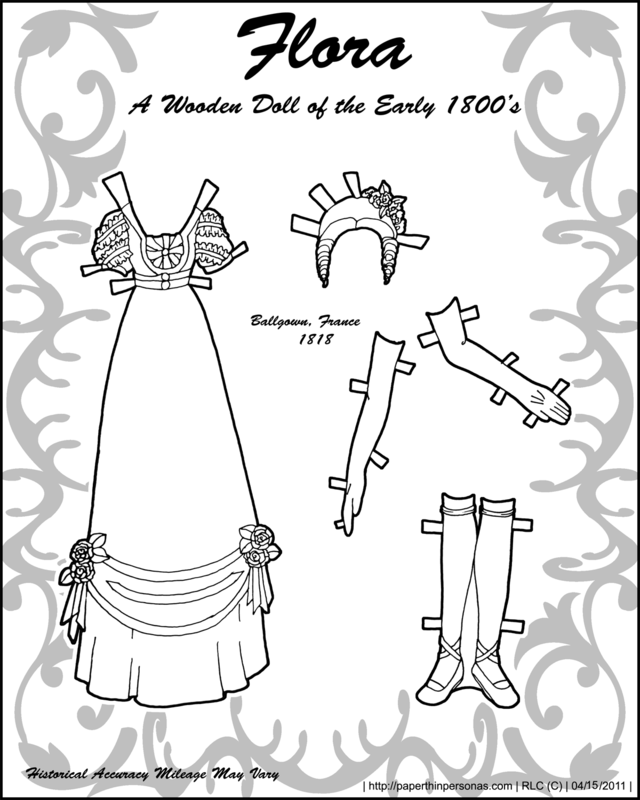 I’m always looking for more information on the right era of costumes for the paper doll. 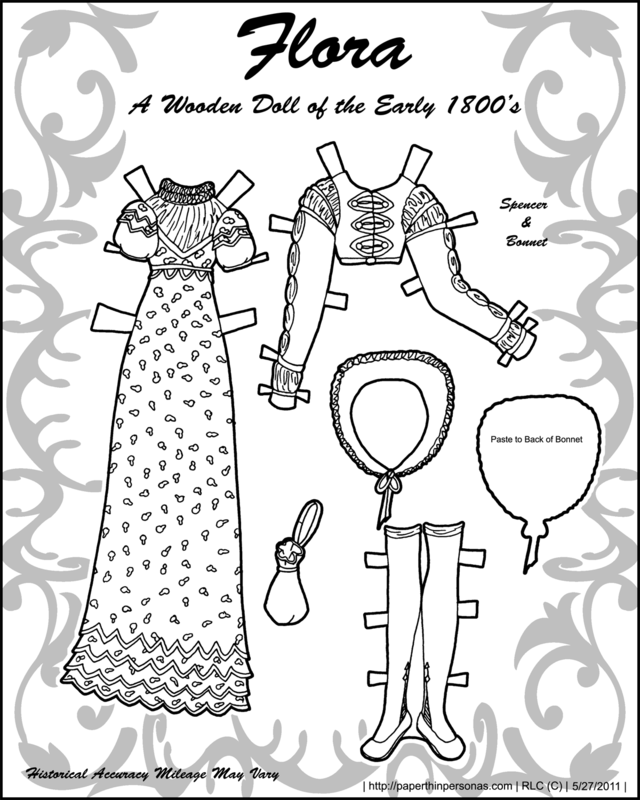 The ballgown on the left is based on a plate from 1812. It is one of the costumes I have wanted to draw for a long time, but it was a challenge for me. I love the yellow trim. Her promenade costume is based on a different plate from 1814. The popularity of the ruffs around the necks of costumes in this era are very interesting. I don’t know if I like the look, but I feel like I have to include them as a matter of keeping things accurate. The dress on the left is not based on anything, really, but the one on the right is based on a fashion plate from the Casey Fashion Plate Index. The Casey Fashion Plate Index demonstrates both what I love and what I hate about a lot of library digitization projects. It’s a wonderful resource, but navigating it can be a real chore. And the lack of searching flexibility annoys me. Still, you win some and you lose some in the land of digital print indexes. I know someone asked for wigs with this paper doll, so here is one. The design is based on illustrations from Corson’s Fashions In Hair which is the seminal text on hair. An absolutely amazing text. And on my wishlist of things I want someday. Maybe it’s just because I’m a sucker for a good looking trousseau for a paper doll, but I love this 1940’s paper doll from The Paper Collector. If you’re not a regular reader of The Paper Collector, then you are missing out on daily updates of neat printed paper things from postcards to some dynamite paper dolls. It’s one of my not so guilty pleasures each day.